Then, I thought STOP IT! Try a paper from a place that’s totally foreign (I don’t want to get in a rut). 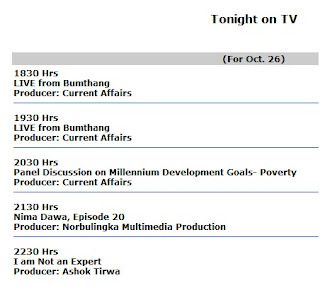 The first paper I chose was from Bhutan. I guess I was going through the list more or less alphabetically. The biggest thromde tsogde, Thim Throm, does not have the minimum required number of aspiring candidates to contest in the upcoming thromde election for the post of thromde tshogde tshogpas……..
…….The voter population of Thim Throm is 6,486 and it has seven thromde tshogpa demkhongs. A little more difficult than I thought. I won’t be understanding Bhutan from browsing the front page over breakfast. 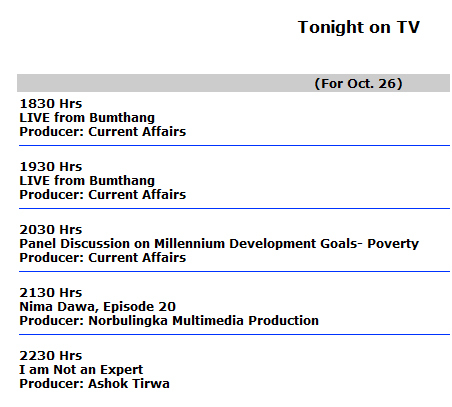 An interesting note is that the Bhutan paper lists the TV schedule for the evening. To tell the truth, it doesn't look much different from what they air in Paris (that's the worst thing I'll ever say about France). These ones were easier to understand. TV in Paris is pretty bad! France 24 is the best for news. They also have a live site which is updated every 20 minutes. Thanks for the visit!